The Five County Treatment Center employees Kitchen Staff which prepare meals for the juveniles placed in the Center. 5-C is audited and meal menus are reviewed by the State Department of Education in accordance with the National School Lunch Program regulations. 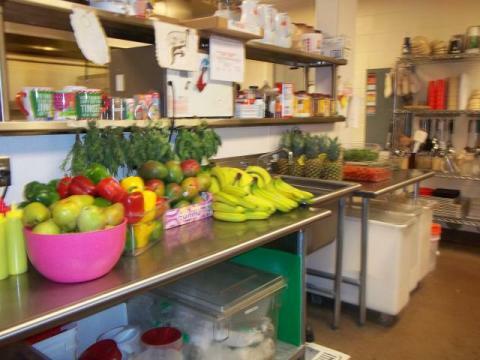 Residents are provided 3 meals and 1 snack daily. The facility including the Kitchen is very well cleaned and organized. Our staff is friendly, professional, and efficient. Kitchen staff maintains reporting and record keeping. 5-C follows standardized recipes and ensure excellent quality nutritional meals. Meals are provided to the juveniles in accordance with RCCI meeting all requirements. Food is not withheld from youth for any reason, including a juvenile is subject to disciplinary sanctions. Each juvenile throughout the Center is offered quality meals and snacks. Residential Child Care and National School Lunch Requirements may be found through the Idaho State Department of Education. Address: P.O. Box 83720 Boise, Idaho 83720-0027 www.sde.idaho.gov/site/cnp/nslp National School Lunch Program-Idaho State Department of Education "USDA is an equal opportunity provider and employer"
The meal pattern and nutrition standards are based on the latest dietary guidelines for the United States. The NSLP Guideline takes a big part in providing our Rehabilitation Center healthier guidelines. Our facility is proud to continue using farm fresh fruit, and vegetables in all our meals and snacks. Fresh spinach, strawberry salads, BBQ pulled pork, homemade ranch dressing, to 100% fruit juice, fresh celery, and peanut butter are some of the ingredients used in the preparation of excellent nutritional meals. This serves as the public release for the Five County Detention & Youth Rehabiliation Center. It is our policy to provide free meals for all residents in our facility. Our classroom operates under the School District #215 Free Breakfast and Lunch program. The facility and the School District main office have a copy of the policy, which may be reviewed by any interested party. The facility may share your eligibility information with education, health, and nutrition programs to help them evaluate, fund, or determine benefits for their programs, auditors for program reviews, and law enforcement officials to help them look into violations of program rules. Our policy is to promote and ensure the wellness of our juveniles while they are detained in our facility. We will provide them with foods and snacks that meet the nutritional values as set forth by the Child Nutrition Reauthorization Act. We currently have and will continue to educate our residents with an ongoing nutritional education program, which includes posters; documents and any other literature that we feel will be of assistance to them in understanding the importance of eating healthy in all aspects of their lives. Our detention facility will continue to serve meals that have been approved by the National School Lunch program for our breakfasts and lunch meals only. These meals are prepared by 5-C Employed Food Service Workers. The center will furnish a snack in the evening, between dinner and bedtime, such as: pretzels/milk, cheese stick, club crackers, peanut butter/celery, animal cookies, trail mix/juice. Our facility will continue to provide the required amount of recreational time for all juveniles as pursuant to the IDAPA, Section 5, Title 1, Chapter 2, subsection 265. Depending on the weather for any given day, our staff will either take the juveniles out to the recreation yard to participate in a group activity or have them stay indoors and work on a large muscle group activity. Any violations of this policy will be documented in an Incident Report that will be submitted to the Director or Center Designee.